A beautiful 500 year old cottage full of rustic charms. Perfect for a romantic getaway or a family holiday. The cottage is situated on a quiet street 5 minute walk to the Market square where you will find a flourishing Market, cafes, restaurants and lovely pubs. There are 2 charming pubs within a one minute walk from your front door. 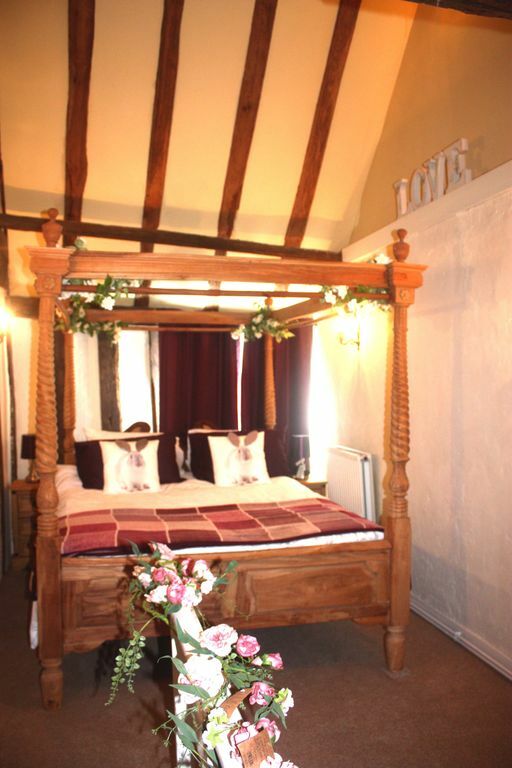 The upstairs bedroom contains a handmade 4 poster bed positioned under an oak beamed vaulted ceiling. Although there is only one main bedroom there is a further bedroom/ box room with a sofa bed at the rear of the property and a very comfortable sofa bed in the living room. So will sleep 6 if required. The country garden has 2 patio areas for alfresco dining and relaxing. The bottom patio offers you views of the stream with Ducks, Coots and the Kingfisher if your lucky. Watch out for the squirrels in the tree canopy above your head. It really is so beautiful here and our favourite place. Faversham is ideally located on the tip of the "Golden triangle" with Canterbury and Whitstable. Both only 9 miles away or 10 mins in the car. Both bus and train links offer alternative travel. Fast 20mbs wifi and smoke and Carbon Monoxide detectors installed. A 43 inch smart TV for your entertainment. Enjoy. Hi. I'm Katie. I live only 1/2 mile from the cottage. I love living in Faversham and enjoy the walks around the Creek and the lovely pubs. I am honoured to host people in this beautiful home. And I look forward to ensuring you have the best time. We are new to hosting (June 2018) but with good communication we intend to be the best we can be. Well organised for booking, getting keys and helping with queries. Highly recommended as a base for visiting Faversham. Delightful garden leading down to creek to sit in. Gorgeous cottage! In a beautiful town. Me and my family stayed for a lovely weekend, the cottage and garden were beautiful. The host have done a really good job at making us feel comfortable and welcome. Perfect romantic retreat. Fantastic location. Great communication from Katie. The house is beautiful and perfect for a relaxed getaway. Easy walking distance to Faversham centre and an 20min drive to Canterbury. It was a real treat for my husband, baby and me. Rachel and family were great guests. Good communication about check in and check out, house was clean and tidy when they left.